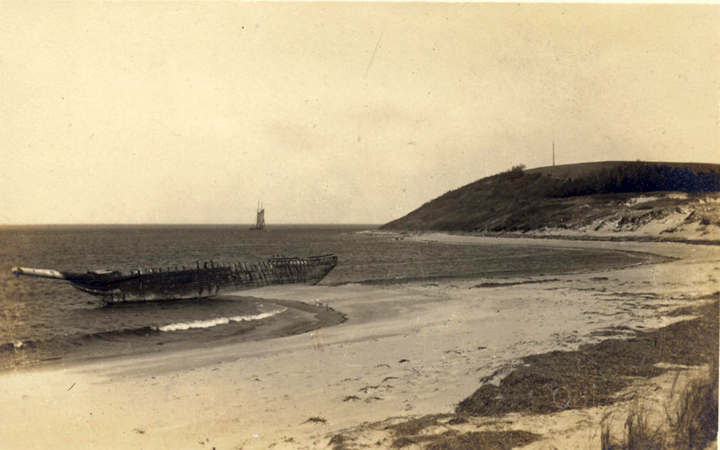 Ada K. Damon shipwreck photo from “Ipswich” by Bill Varrell. Christmas, 1909 witnessed the heaviest storm in many years and is known by sailors on the Atlantic Coast as one of the most fateful days in the history of these waters. The “Great Christmas Snowstorm” struck the North Atlantic States hard as far south as Maryland. Philadelphia had 21 inches in 23 hours. The storm did its greatest damage in New England, where winds gusted to 72 mph in Rhode Island. The gale assumed terrific force on Christmas night and continued well into the following day. 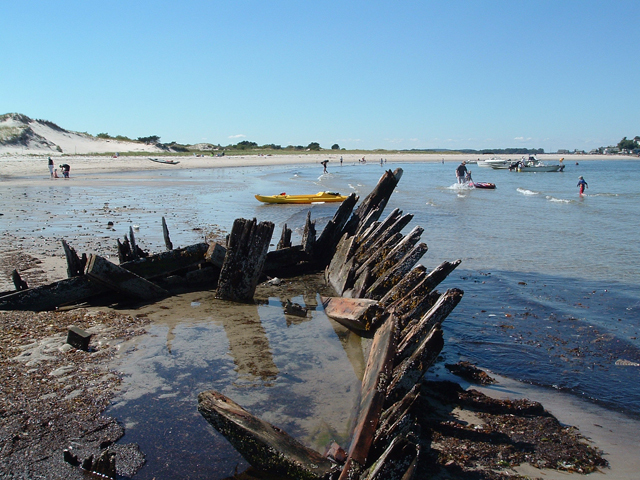 The list of shipwrecks and deaths was said to be as long as the Coast itself. Capt. 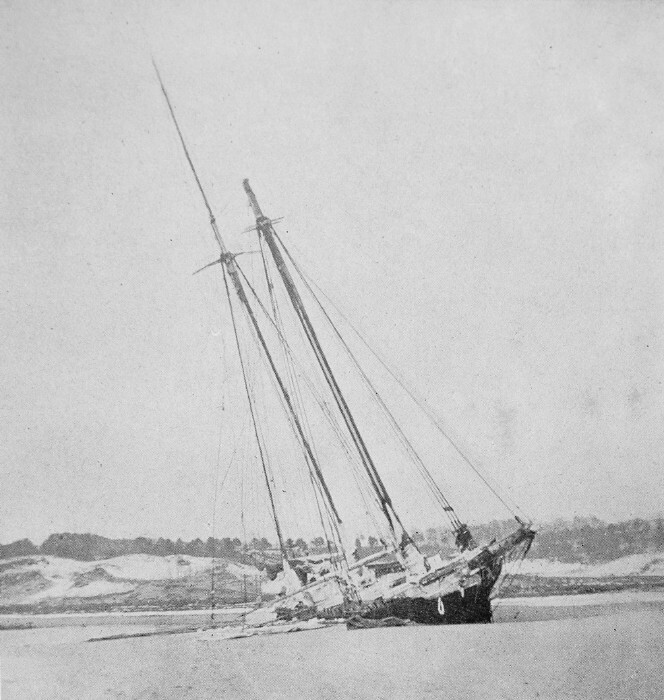 A. K. Brewster had sold his farm in York, Maine and invested everything in the sand schooner Ada K. Damon. The Ada K. Damon was a two-mas schooner built in 1875 at H. A. Burnham Boat Building in Essex, Massachusetts. 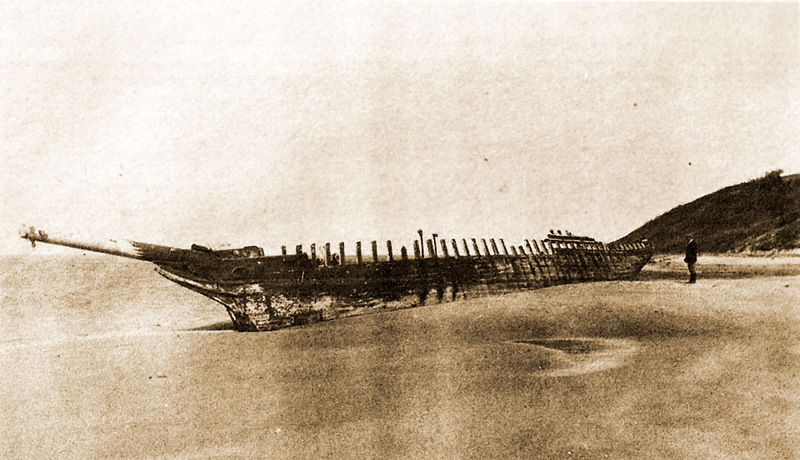 She was 84 ft long and had a beam of 23.3 ft and a depth of 8.2 ft. 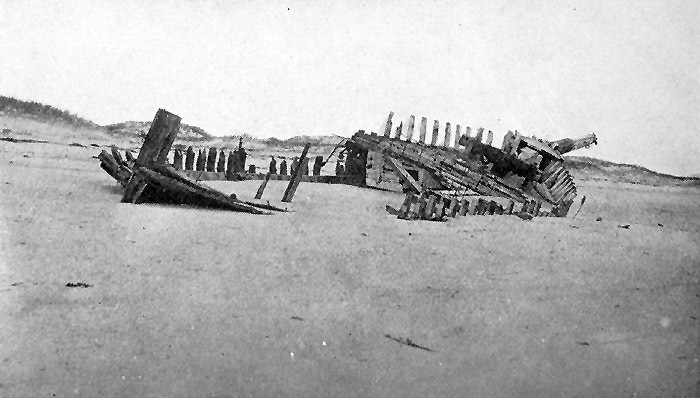 The ship was wrecked during his first trip for a load of sand from the plentiful supply on Plum Island. 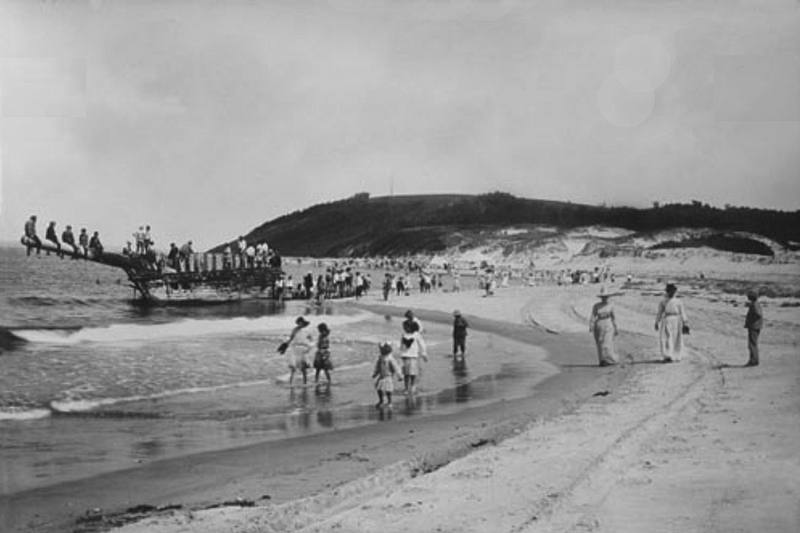 On the 26th of December, 1909, she stranded 3.5 miles south southwest of the Plum Island Coast Guard station. 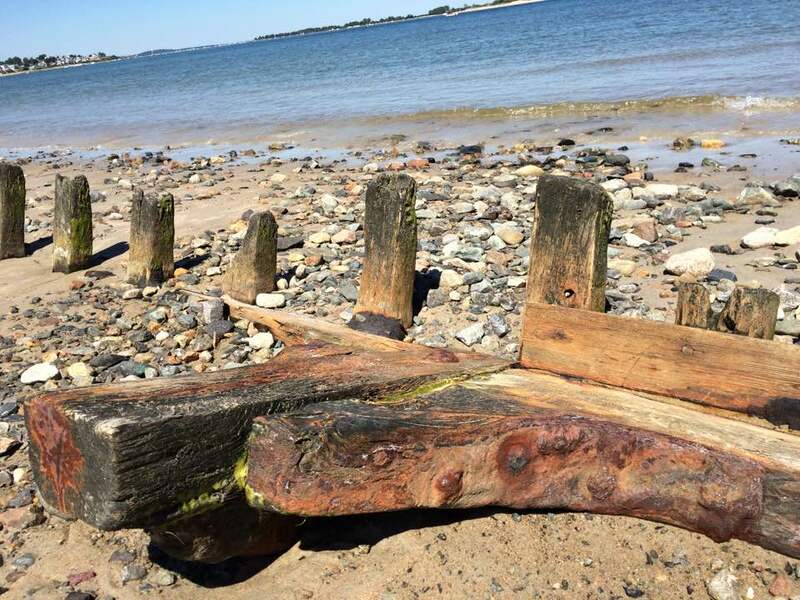 The gale swept down from the northeast thick with snow, the anchors dragged and parted, and the ship wrecked on Crane beach at high tide. 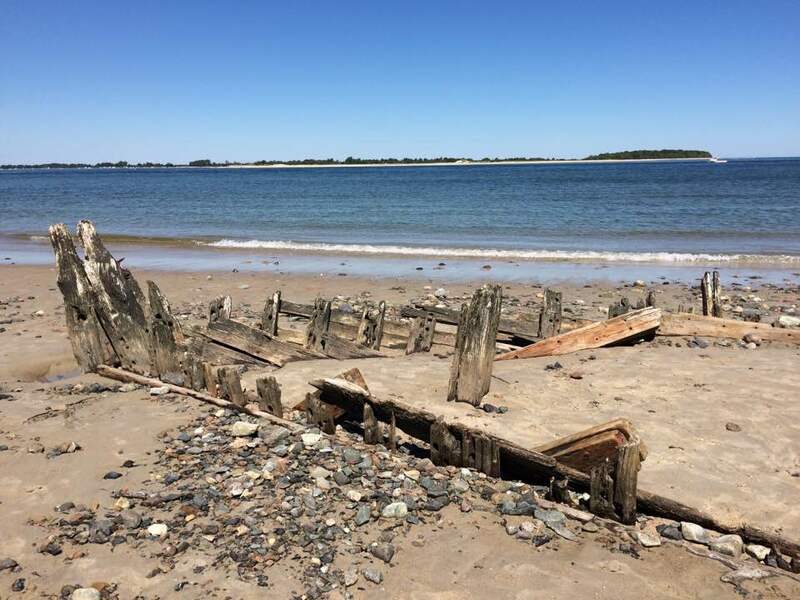 The Plum Island station crew visited the wreck on December 27th and found her full of water with the sea breaking heavily over her. Fortunately the ship crew were safely on shore. Captain Brewster declined assistance, not ready to admit defeat. Ada K. Damon immediately after wrecking on Crane Beach. Photo from “Sand Dunes and Salt Marsh” by Charles Wendell Townsend. On December 28th, Capt. Brewster again declined assistance and told the station crew that he was going to sell the vessel to wreckers. On Jan. 2, he informed the lighthouse keeper that he could find no one to buy the wreck. On the following day the life-saving crew arrived to assist him in stripping the ship, and the vessel was a total loss. The unfortunate elderly captain returned to Maine penniless, seeking farm employment. 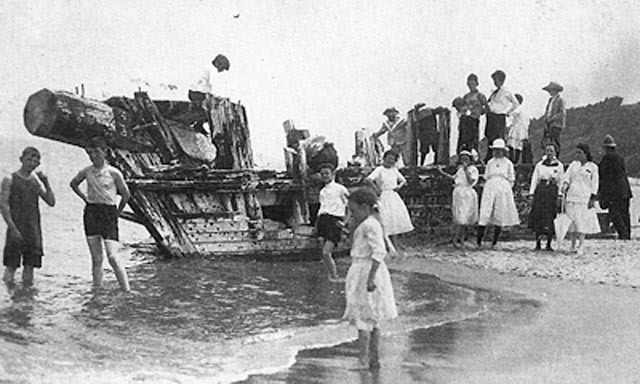 Ada K. Damon one year after wrecking on Crane Beach. Photo by Charles Wendell Townsend. The marooned ship became an instant attraction, but less than a year later she was buried to the deck. After a year only upper sections of the frame were visible. 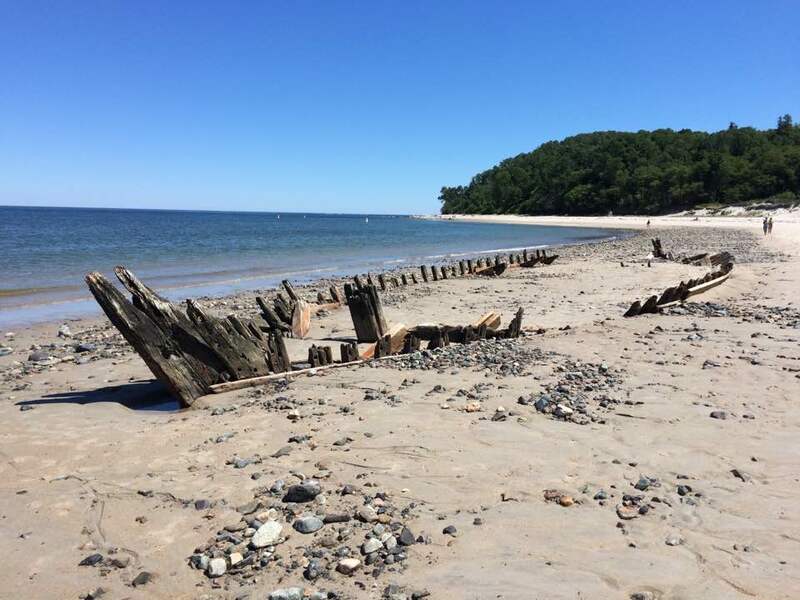 The ship had not moved since it is well-anchored in the sand, and in the summer of 2003 and 2004 the skeleton of the ship could be seen offshore at very low tides. The sands of Crane Beach are slowly moving toward the mainland. 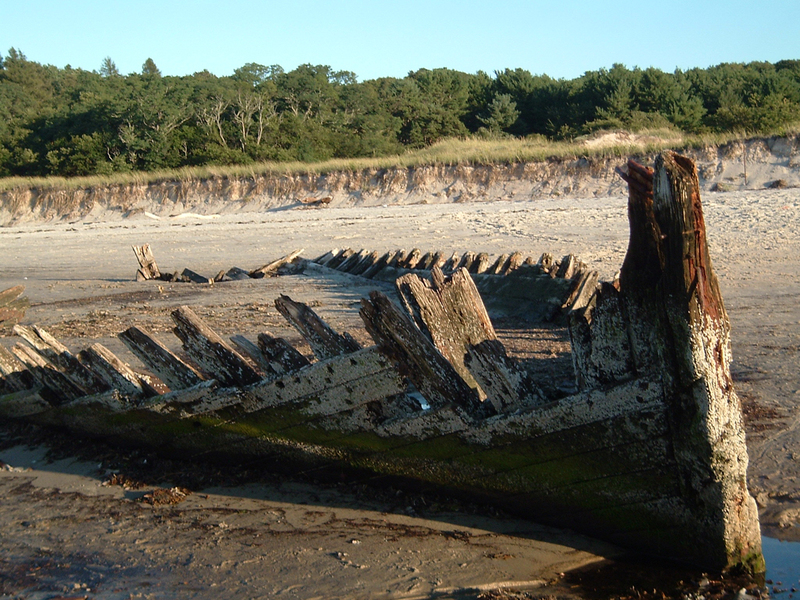 Photo by Bill Sargent, 2004, of the ship frame, which emerged from the sand after being buried for a century. 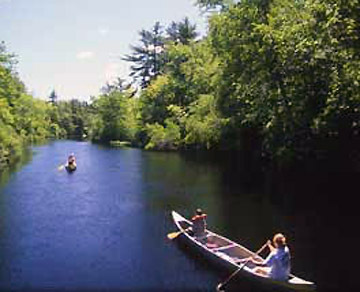 It has been determined by measurements that the wreck that emerged in 2004 is the Ada K. Damon. 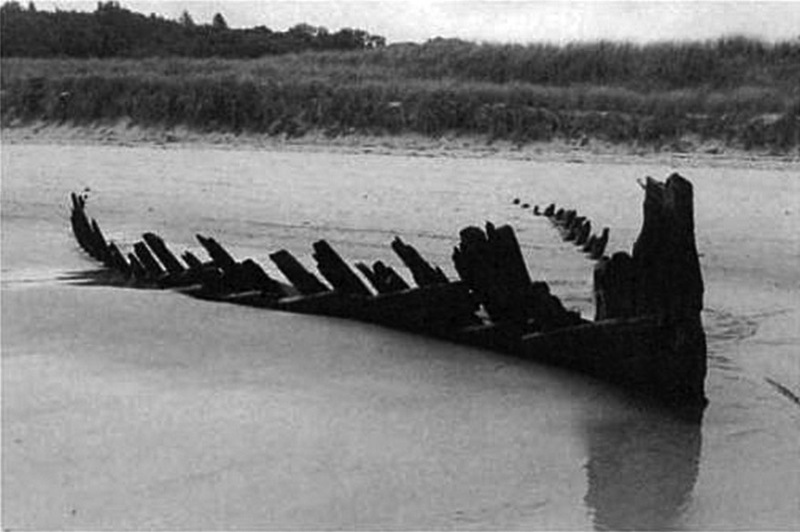 It bears a resemblance to an older ship skeleton that Charles Wendell Townsend photographed in Sand Dunes and Salt Marsh, and the then-recent wreck of the Ada K. Damon. The stern or bow of another ship, possibly the Edward S. Evelyth, lies nearby at the water’s edge, covered with green moss. 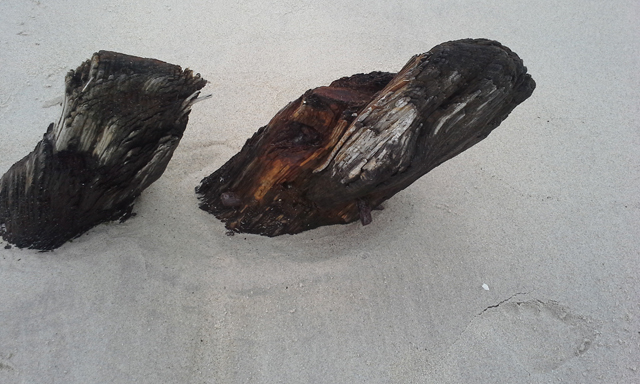 At very low tide, I have been able to wade into the water and observe the faint outline of a ship’s skeleton. 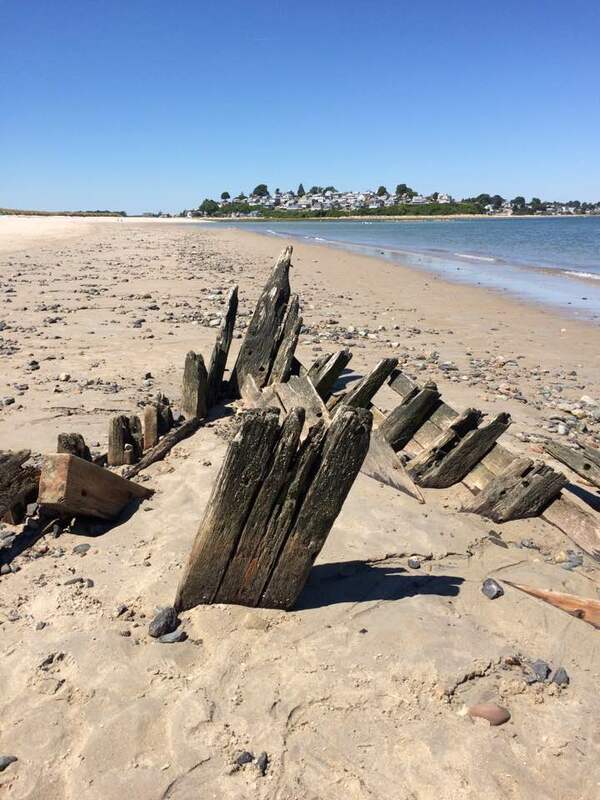 Glenn Harris took this photo at Steep Hill Beach on July 16, 2014. Buried again, this was almost all of the ship that was visible. View more photos of the brief reappearance of the Ada K. Damon, 2003-2004.